The federation has the pleasure to greet the first newsletter, mainly due to the initiative and diligence of the media commission. Since its founding in 2012, our organism continues to grow. The communication needs of our community, a presence on the web and social medias, as well as the establishing of more dynamic communication platforms are becoming priorities. The committee hopes the newsletter will fulfil its readers’ expectations. Don’t hesitate to contribute with suggestions, or content related to your group’s activities, that you would like to see broadcast to Swiss practitioners. Waiting for our next meeting at the Swiss Gathering 2016, please take note of a call for applications from your committee, for a series of missions that we want to see happen in the next future (Read in German / Read in French).. The main event of the federation is as usual the Swiss Gathering in Schönbühl, a weekend in automn. The 2015 edition hosted 50 attendees in the Feder tournament, together with workshops in three gyms. The federation also proposed public presentations during the Waffenbörse in Luzern (18/20.03.2016). The ELAA invited Swiss clubs of HEMA to the third edition of its event in Lausanne, held on the 19th and 20th of March. The 21 entrants had the opportunity to confront each other, on Saturday in a longsword tournament, and to try the sidesword on Sunday. Under Simon Favre’s initiative, in charge of the event, rules have seen the introduction of a small innovation: the attribution of “esthetic” points to reward actions brilliantly performed during a fight. These points count in the final score, but also allow to win a prize for the most accomplished fencing, technically speaking. However, the lack of entrants led to the cancellation of the feminine tournament, which was supposed to encourage women to enter a sport still predominantly masculine. Anyway, the ELAA looks forward to meeting again fencers from all horizons during its next event. At the beginning of this year, on the 16th and 17th of January, our association invited 5 French instructors, members of the French federation, for a double class dedicated to cane fighting in the late 19th and early 20th century on Saturday, and to Joachim Meyer’s stick and longsword on Sunday. On Saturday, Jérémie Clog and Olivier Dupuis (ELSAMHE) presented “canne de salle” practised by Leboucher and Larribeau in the 19th century. Claire Hugues and Johann Perrigault (OGN) gave a workshop on Vigny’s cane, incorporated in the Bartitsu, in the early 20th century. The end of the cane combat day was handled by Cyril Perrier (CaP), who showed the use of the cane in self-defense according to Emile-André, Dubois and Joseph-Renaud. This first class, dense in technique and practise of the cane, was followed by a second day focalised on a specific posture in Meyer: the Zornhut. From this “wrath guard”, Olivier Dupuis and Jérémie Clog presented specific techniques from the stick and longsword. A rewarding weekend ! Artes Certaminis in Gais hosted Christophe Le Millier for workshop in the art of Destreza on 5th March 2016. Christophe originally hails from the Associació Catalana d’Esgrima Antiga in Barcelona, now lives in Geneva and there trains with GAGSchola. The workshop gave us a solid introduction to the beautiful art of this Spanish school of rapier fencing, taught by an accomplished rapierist who regularly ranks at the top of the field in tournaments. It was particularly gratifying that participants included not just members of Artes Certaminis. We were able to welcome friends from clubs in Zurich and across the border, and even had a participant who had learnt about the workshop in the press and was intrigued. The next event organised by Gagschola will take place on Saturday, the 21th of May. The theme tackled during this day is sword and buckler fencing as from the I.33 manuscript (Royal Armouries). 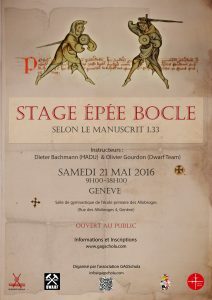 To this occasion are invited Dieter Bachmann (HADU) and Olivier Gourdon (Dwarf Team). The event is open to beginners as well as to confirmed martial artists. There are still places left. Register ! Leo et Ursus association has the pleasure to invite you to their first sparring event open to the community, held on Sunday, the 29th of May, in Bern. Many people ask us if a new international event will soon take place in Saint-Cergue. After the first edition in December 2012 (Wittenwiler) and the second of january 2014 (Liechtenauer vs Fiore dei Liberi), we are happy to announce the third edition of the International Historical European Martial Arts of Saint-Cergue ! It will take place on Saturday the 21st and Sunday the 22nd of January 2017, and will be dedicated to the Gemeyn Fachten, the common fencing through Germanic sources (15th-16th c.). Book these dates in your agenda. More information will be available soon on Gagschola’s website and facebook page. The Association Médiévale Romande aims to enhance the medieval heritage of Western Switzerland through numerous volunteer activities. It gathers about 40 members form several french-speaking cantons, and intervenes for institutions and cultural manifestations. In 2014, the AMR created a HEMA commission in Neuchâtel canton, in order to promote the activity through exhibitions, initiations, and weekly trainings. The logo chosen by our section uses the colours of the canton, green for mountains, white for agriculture, red for vineyard. The white cross of the red part is transformed into a Fechtfeder in order to represent one of the main axis of our approach. Finally, the logo is topped with the silhouette of AMR main logo. 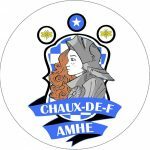 La Chaux-de-F.AMHE (canton of Neuchâtel) joined with great pleasure the ranks of SFHEMA last October, after a year and a half of early stages and structural establishment. With a weekly training based on Meyer’s longsword, but also Fiore’s dagger or F. Le Bordelais’ wrestling, the work is articulated from the interpretation of sources and the learning of body and weapon movement. Its 4 regular members hope to increase their number in the near future. 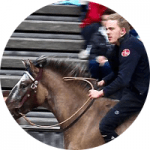 The Swiss Rossfechten Association aims to provide a forum and focus for the Swiss practitioners of medieval riding and mounted fighting skills. Along with unarmoured and armoured fighting, Rossfechten constitutes the third discipline treated in the fencing manuals of the late middle ages and early modern times. The objective is to understand and recreate the techniques described in the manuscripts. In 2014, the club organised the first Rossfechten Symposium at the former princely stud in Zweibrücken in the Saarland as well as the second, 2015 symposium in Barisis, not far from Coucy-le-Château in France. At the Spanish Mustang presentations for the April 2016 OFFA in St Gallen, members of the association gave spectators a taste of the art. organise events linked to the promotion of the aforementioned goals. We announce you the creation of the Media Commission, whose aims are to register, treat, safeguard and diffuse photographic, filmographic and textual elements of events, internal as well as exterior, in which the SFHEMA is engaged. It is also in charge of the website, the publication of actualities, the newsletter, and the facebook page. The Media Commission will then broadcoast this information, especially through the new website of Swiss HEMA, social networks, as well as the official newsletter. Publications will be in German, French and English: we are still looking for someone to translate into Italian.